Students from Veterans Elementary School teamed up with the local non-profit, Marlow B. Martinez Foundation, to collect food for local Coast Guard families in need. 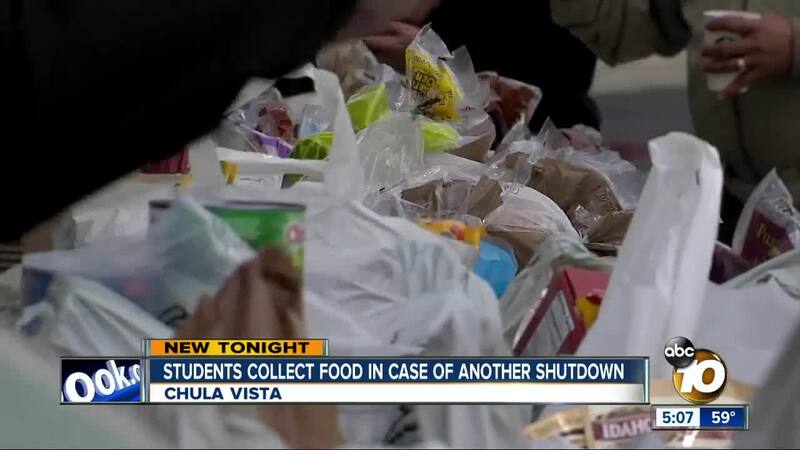 CHULA VISTA, Calif. (KGTV) -- Students from Veterans Elementary School in Chula Vista teamed up Sunday with the local non-profit, Marlow B. Martinez Foundation, to collect food for local Coast Guard families in need. The foundation helped Coast Guard families during the longest government shutdown. Since the government was funded for only three weeks, the foundation's creator, Marlow Martinez, decided to collect food again in case the government shuts down on February 15th. Veterans Elementary hosted a class competition to see who could collect the most amount of food. The winning classroom will get a pizza party. The students collected more than 1,000 food items. The food will be distributed to Coast Guard families on base this week. If Congress does not agree on a funding bill this week, the government will partially shutdown again on Friday, February 15th.